Anthologies are hard to pull off, you either get it right or you don't. When you get it right you get Creepshow, V/H/S, Tales from the Darkside and Trick 'r Treat, but when you miss you get V/H/S: Viral, Creepshow III and All Hallows' Eve 2. 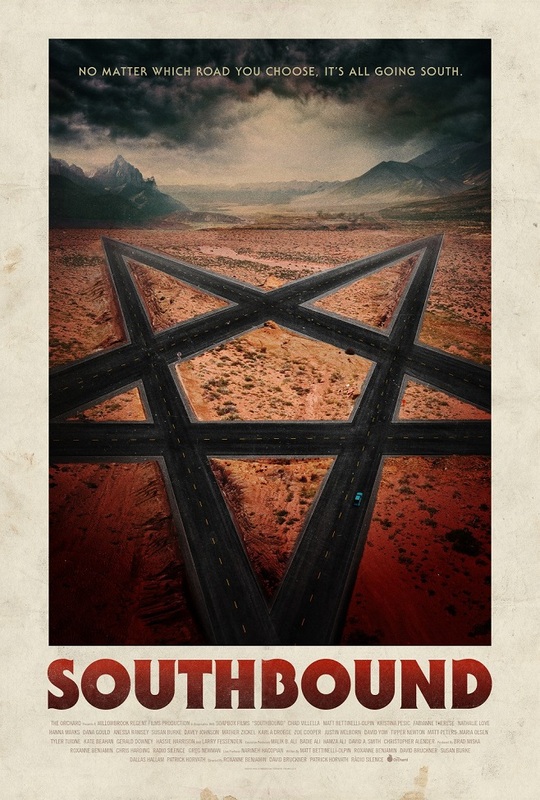 Thankfully though, Southbound falls onto the positive side of the horror anthology genre. When talking modern anthologies it's usually a group of filmmakers who come together and each make a short, distinct entry tied together by a common thread. Yet Southbound takes it a step further by bringing a group of filmmakers together, having them each create an entry, and then having each entry flow into the next in a seamless transition. It feels more like one liner story and not like a anthology at all, which is very impressive. Each entry is integral to the last and by doing that it makes it impossible to pick one over the other or rate them individually. Also, unlike modern anthologies, there is no "weak" entry here. Each entry is crafted beautifully and in such a way that they are collectively one perfect entry. I can not for the life of me think of a film to compare this to and I really like that. Another amazing aspect of the film is that it exists in an "infinity loop", the ending is always the beginning and the beginning is always the ending. The SFX are done exceptionally well across the board also. Usually I loved to talk about the practical effects, but for the first time ever it's the digital effects that got me. To be specific, in the first/last segment there are these Reapers that show up and are, for lack of a better word, badass. They're a completely digital creation, but are so well done and cool looking that it doesn't matter they're not practical. The practical work is awesome, but those Reapers steal the show. Southbound is a unique horror anthology that doesn't feel like an anthology. Radio Silence's Way Out - Way In wrap around, Roxanne Benjamin's Siren, David Bruckner's Accident and Patrick Horvath's Jail Break are amazingly done and so cohesive you won't believe it's a collaborative film. I hope this is the direction that future anthology films are heading and, as always, I look forward to viewing more from this crop of filmmakers.